Whether it’s freezing outside or a hot summer day, nothing beats the thrill of tasting locally crafted beer. Luckily, we have seven breweries in or close to Mason City – two of which are located in the heart of our Downtown. We invite you to check out the North Iowa Brew Tour! 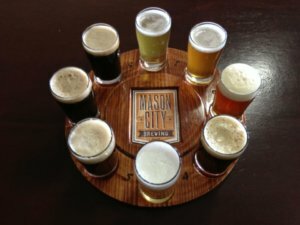 Did you know, Mason City Brewing is the first brewery to open in Mason City in 130 years? Since 2013, they’ve been serving tasty, quality beer. The beer menu changes frequently so there’s always something new to try – you may just want to order a flight and try them all. If you’re visiting during the week, stop in on a Wednesday or Thursday night for FREE American Pub Trivia. Always free to play and no purchase required. $50 cash & other prizes given away nightly. That’s right – every Wednesday & Thursday – BEER, TRIVIA and a whole lotta FUN! Fat Hill Brewing is 100% locally owned and operating 7-barrel craft brewery. The taproom is located in a large, restored, historic building that sits in the heart of downtown. The brewery has sixteen taps, and a menu that changes often providing visitors a variety of delicious beers, ciders and non-alcoholic drinks to choose from. You can even bring in your own (unopened) bottle of wine to drink and pay a minimal $1 bottle-open fee at the bar. Oh, and one last thing – be sure to check out their calendar of events, live music and entertainment happenings 2-3 times a week! Try the ‘Old Man River’ Citrus Wheat, or the ‘Slightly Off Kilt’er” an Irish Red Ale at the Rustic Brew in Hampton. At the Rustic Brew you’ll find a great selection of micro-brews, a delicious seasonal, ‘Pumpkin Ale’ and a variety of upscale wines from BlueStem Winery of Parkersburg, IA. Take a break, sit back and enjoy the home-like atmosphere at Lake Time Brewery in Clear Lake, a neighboring community just 7 miles west of Mason City. 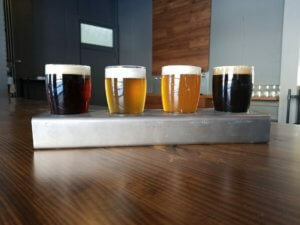 Lake Time Brewery offers 10 different beers on tap, including specialty and seasonal brews. All brews are crafted specially for their customer-base and served in an inviting atmosphere that is conducive for conversation. 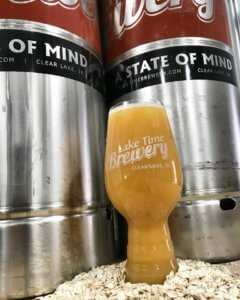 5 Alarm Brewing Company is named & located at the site of The Lake Mills Fire – a Code 3 fire (5 Alarm fire) that destroyed the community’s original fire station. The brewery serves a variety of tasteful brews and offers weekly, local entertainment. Guests are welcome to bring in snacks or have food delivered. 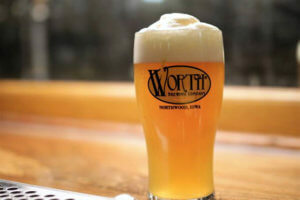 Worth Brewing Company is owned by brewer Peter, a brewer of 30+ years, and his wife, Margaret. Together they’ve been serving hand-crafted, high quality, distinctive beers in Northwood since 2007. The brewery is located in a beautiful, historic building which hous taproom on the main floor and a ballroom on the top floor which is a popular venue for parties and special events. 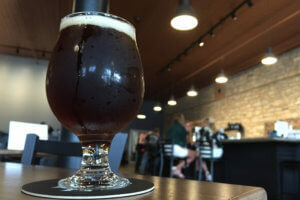 The newest to join the North Iowa Brew Tour is Saint Charles Brewing Company located southwest of the Cedar River, in Charles City. The micro-brewery, a former glass-repair shop building has been renovated into a warm and welcoming brewery accented by two windowed overhead doors and a hand-crafted bar. The brewery offers 8 craft beers, as well as bottles of Millstream Root Beer and a selection of wines. Visitors are welcomed to bring in their own food or order delivery from local restaurants, such as Cedar River Pizza. The brewery provides board games, and occasionally host special live entertainment for visitors. It’s a date in Mason City!